The Calista Solitaire Engagement Ring has a trellis style 6 prong head that holds the center stone atop a wide, slightly squared edge shank. Starting price is for setting only. Metal Weight: 3.4gr. to 8.8gr. Band Width: 2.9mm to 5.56mm. 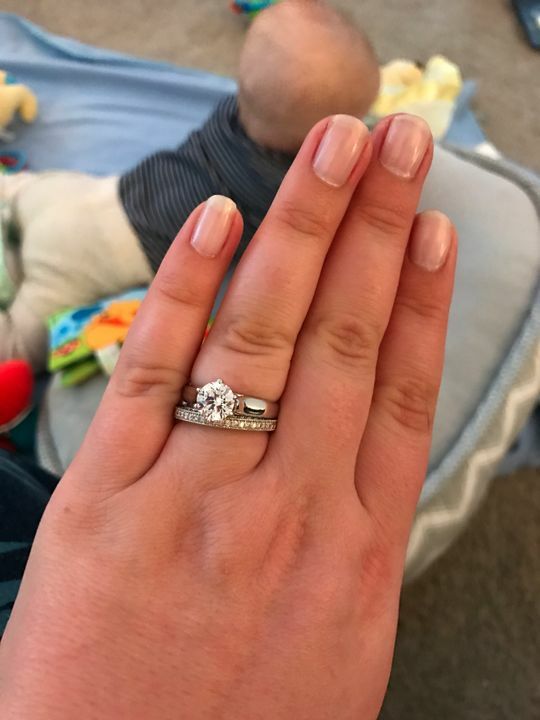 Erika K. Reviewed by Erika K.
It took me two weeks to finally pick this ring and I'm thankful I took that time. I was looking for uncommon qualities in a ring; wide band, low profile, solitaire, with 6 prongs. Well this is the absolute perfect ring! I'm a paramedic so I didn't want a high profile ring that will snag on miscellaneous objects/people while I'm working or puncture gloves. I have 1.5 carat diamond hybrid set in white gold and I get compliments every day. It's absolute love.